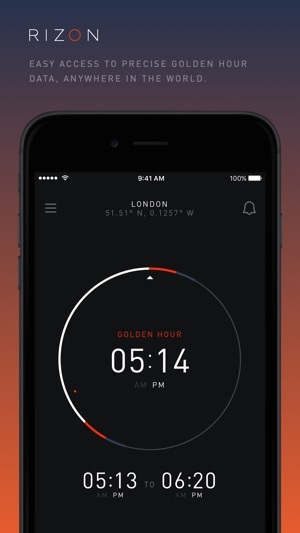 Rizon is the easiest way to get access to precise Golden Hour data in the palm of your hand—anywhere in the world. Find the best time to take photos outdoors with your new shooting companion. 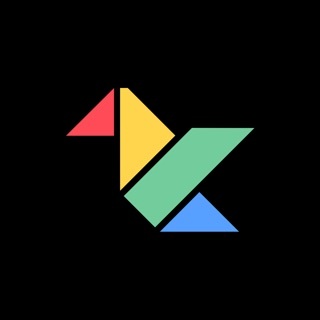 PetaPixel, AppAdvice, The Next Web, Wired, LifeHacker, Product Hunt and more! Plan the perfect photography shoot in advance for any date in the future by simply rotating Rizon’s clock. You can plan for other locations too! 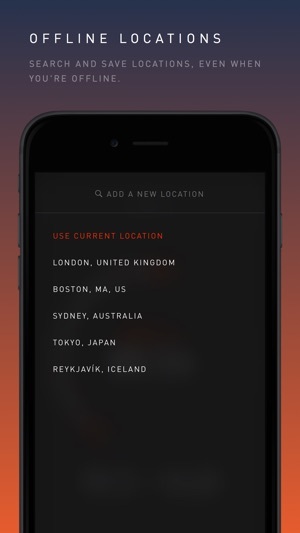 Search and add a custom location—all while offline—great for when you have no data. 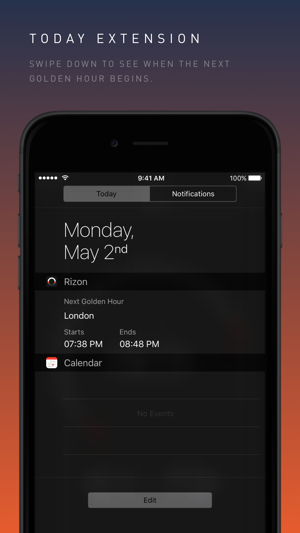 Never miss Golden Hour with Rizon’s Repeat Reminders. Choose when you’d like to be reminded and let Rizon do the rest. The set-and-forget style reminders are perfect to keep you motivated to get outside every day. 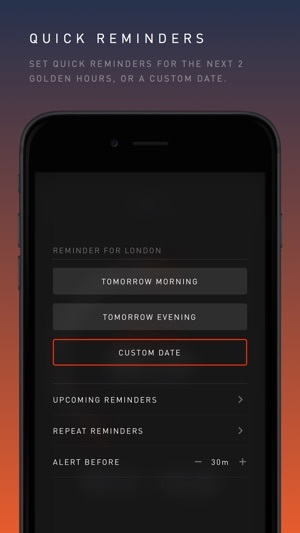 Alternatively, set a Quick Reminder for the next Golden Hour, or get finer control with a custom date. We've added a new Today Extension, giving you easy access to the next Golden Hour from anywhere! Best app I've found that gives me all the best times for the photography I'm planning on doing. 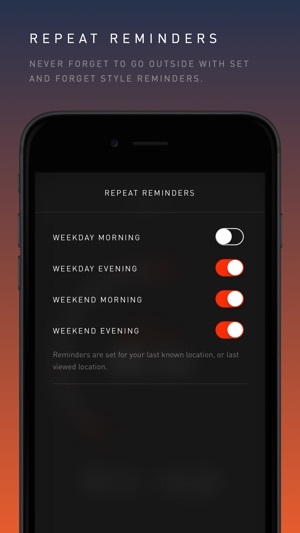 My only complaint against the app is the customized reminders. I wish I could set a specific time based off the time I plan on taking the photos(just before twilight for example) without having to bounce between another app like reminders. Otherwise a small complaint and the app does exactly what it says it does and exceptionally well. Sometimes things are pretty simply because it's more fun to use that way. That is the case with this UI. Sure, it could be a table, but this is just as useful. 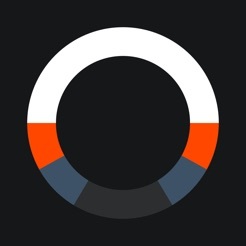 Yes, the circle is a 24 hour period. 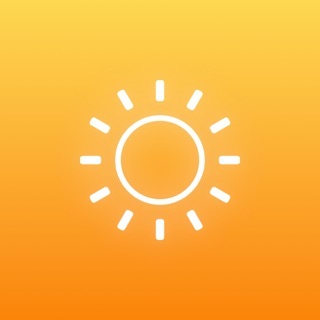 Light is day, dark is night, and orange is a golden hour. The red dot is the current time. Would a table be faster? Sure. But this is beautiful and fun to use. Does one thing and does it well. Eliminates any guesswork about when to go out and shoot. Also gives you the ability to set alarms. Totally worth two bucks.